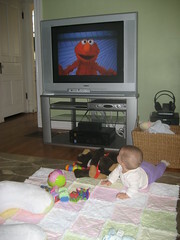 The American Academy of Pediatrics recommends no TV until a child is two years old. And I think I agree with that. Often I put my iPod on shuffle and we listen (and dance) to that. Or we simply enjoy the quiet. Of course, this doesn’t mean Andy and I have banned TV altogether. I watch the news in the morning and I like to watch a rerun of Gilmore Girls in the afternoon. And lately, football is always on on the weekends. But when the TV is on I try to keep Sophie busy with her toys. And usually, that works. Until I turned on Sesame Street. I think Sesame Street is a good show. But given that Sophie is only 7-1/2 months old, I didn’t think she’d care about it. Oh, was I wrong. So are shows like Sesame Street OK if they’re on in the background? But if on, would they really be “in the background?” Or would she watch intently, eyes glazing over, numb to everything tactile around her? And then there’s the show Signing Time. We’re trying to teach Sophie sign language and everyone has said Signing Time is a great learning tool. So should that show be allowed? This entry was written by kara, posted on November 17, 2008 at 9:28 am, filed under Uncategorized. Bookmark the permalink. Follow any comments here with the RSS feed for this post. Post a comment or leave a trackback: Trackback URL.